It's Virtual Scrapbooking Night (VSBN) over at Split Coast Stampers, and I am hosting one of the challenges. Our theme this time is Take a Leap (because it's leap year), so all the challenges have the underlying theme of leaping or jumping. Please join us for the weekend's challenges. We have 9 challenges for you, and you have a week to complete as many as you like. 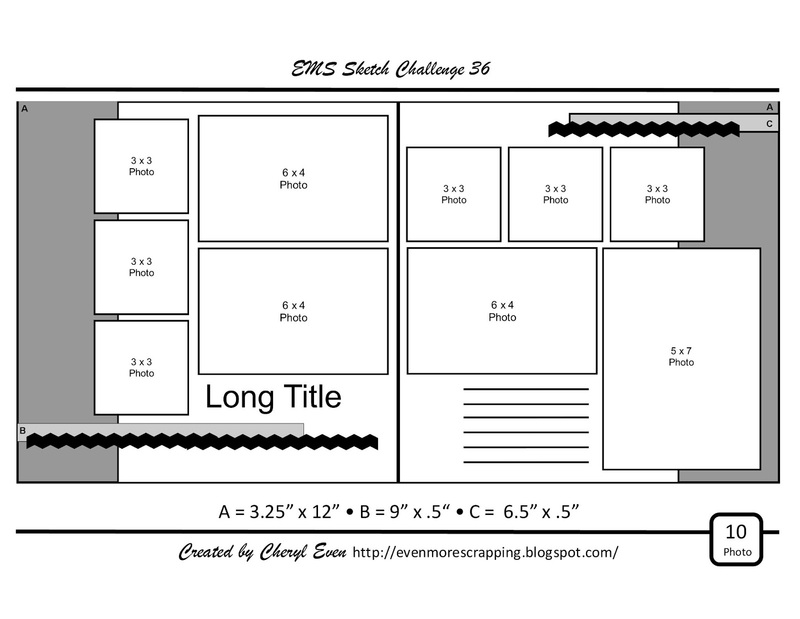 The only catch is you have to complete each layout in 2 hours or less. The time is cumulative, so you don't have to do your layout all at once. When I think of leaping, the first phrase that comes to mind is “Leaping to Conclusions.” How often do we hear or see something and we don’t wait for the end, we just leap to a conclusion regarding what it’s about? For this challenge, I would like you to create a layout that makes people leap to a conclusion, and then spring a surprise on them. For example, your title could have a hidden part or use some word play, or your pictures could only show part of the story and everyone has to read the journaling to get the real story. Get creative, and please keep us guessing! 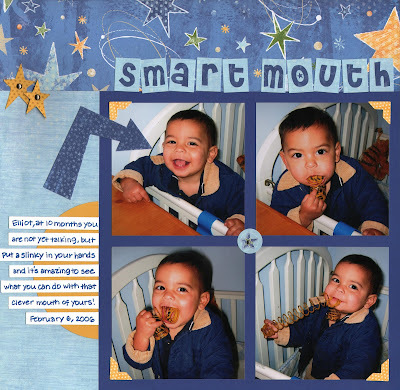 For my sample layout, I picked these pictures of my son playing with a Slinky. When I hear someone called a smart mouth, I usually think he or she is being sassy, but for this layout, I took it a different direction! 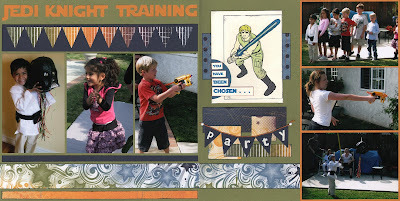 For this layout of my son's birthday party last year, I started with a sketch from Let's Scrap (from 12/28/11). 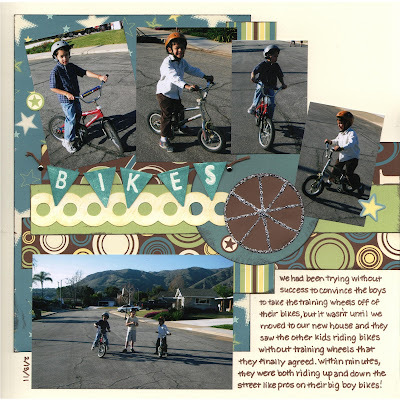 One of the options for the sketch was to add six extra photos by including a fold-out on the right hand page, which I did by adding a 6" x 12" Flip-Flap. Sorry, I won't be showing you the other photos, so just picture kids fighting with light sabers and completing an obstacle course like Luke Skywalker on Dagobah (minus the swamp). I included the invitation I had designed using clip art and the Star Jedi font. I also used the Star Jedi font to cut out my title on my Wishblade. I liked the banner theme on the left page of the sketch, so I decided to add a banner to the right page as well, and I embossed the letters onto it, which qualifies for the Heart 2 Heart embossing challenge for this week. 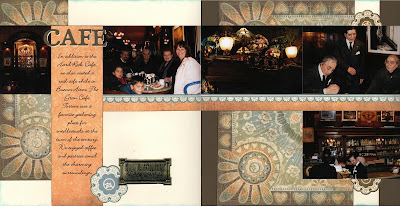 And since this is a layout about celebrating Elliot's birthday, it also qualifies for the "Let's Celebrate" variety challenge (SBVC174) from Split Coast Stampers. This must be sketch week, because I needed a sketch that fit 10 photos in certain sizes, and I couldn't find one I liked, so I made one up. 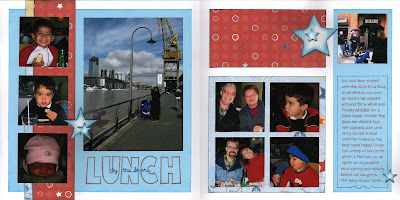 The photos are from someone's else's child's birthday, so I won't add my journaling until after I've posted this. Hope you like the sketch, and let me know if you use it! Here's another layout using the Heart 2 Heart sketch for March. You can see the sketch here. I omitted the heart from the original sketch and substituted a circle border instead. The pennants are supposed to lie in a nice smooth arc, but they got a little tweaked when I scanned the layout, and I didn't feel like re-scanning! I wanted to have a train track on this page somehow, and when I saw this sketch from Split Coast Stampers, I knew it would work just right. 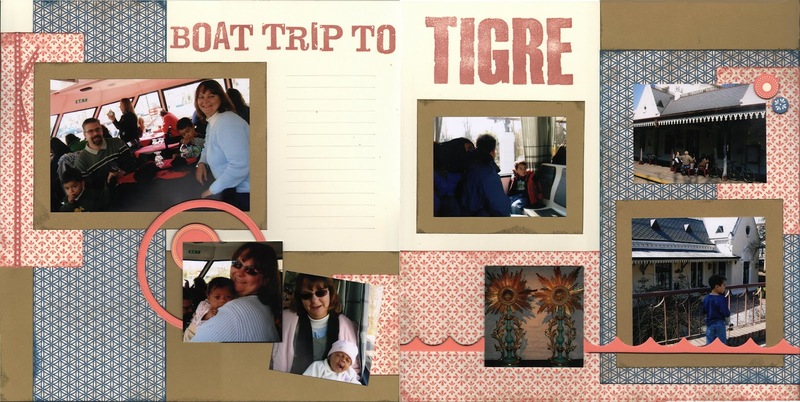 The hardest part was figuring out how to cut the curve in my photos and paper, but once I had that under control, the rest of the layout fell into place easily. I haven't done a personal sketch challenge for a while, so here's my latest sketch creation. 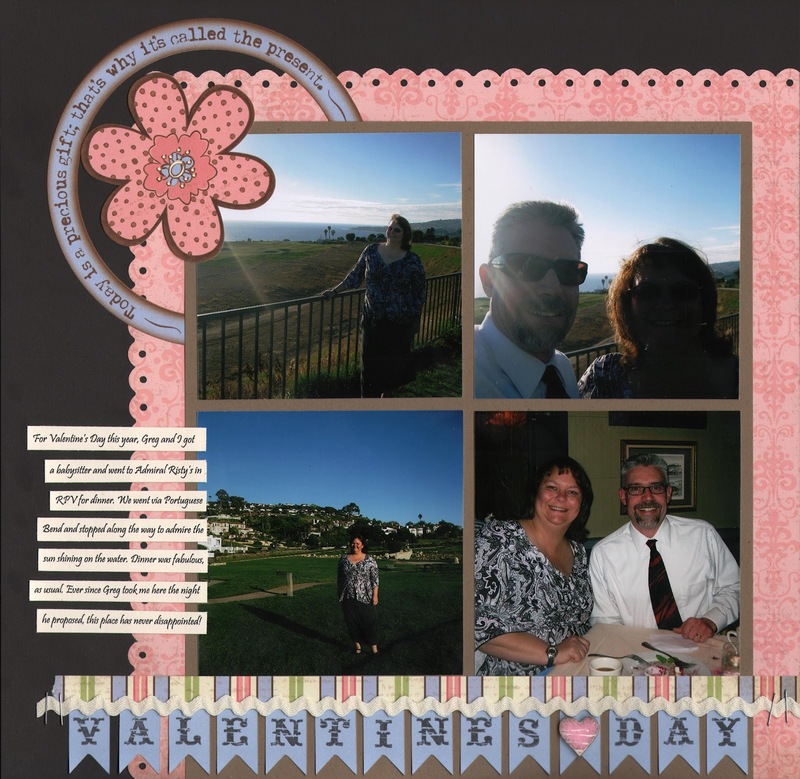 I changed it up a little after I designed the original sketch: I put an embellishment where I had originally intended the journaling to go, and I replaced one of my photos with journaling. It's kind of fun to see how a layout takes on a life of its own, even when I'm using my own sketch! As always, please let me know if you use the sketch so I can admire your interpretation. Super simple layout using only paper and cork letters. I used Sketch Support 1 Page Sketch #15. I was scrapping with friends yesterday and commented that I didn't really have anything new or interesting to say about these photos of our zillionth trip to the zoo. The other ladies sympathized, and one mentioned it was like deja vu. 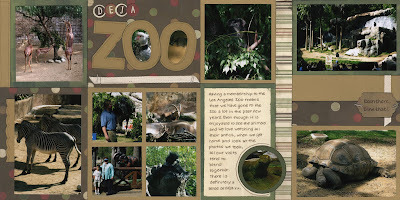 That led me to the title, Deja Zoo! I free-handed the title letters and added the sub-title using stickers. I used a (slightly adapted) sketch from the Let's Scrap blog. Happy Saint Patrick's Day, everyone! I've fallen a bit behind on my LOAD challenge, but am determined to get caught up today. Here's my first layout. This week's inspiration challenge at Split Coast Stampers was to browse the Celtic Shamrock site and be inspired by something there. As soon as I saw this cute patchwork kitty, I knew what I wanted to do! I went through my paper packs and cut out a bunch of 1" squares. 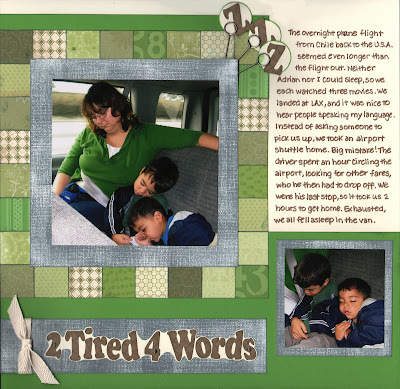 I was able to use lots of scraps, and it was fun that all the different shades of green actually look okay together. Instead of using regular Grey Wool cardstock for my accent color, I used White Daisy textured cardstock and brayered it with Greg Wool ink, trying to mimic the texture of the van's seat cushions. I also added a few Foundry Pin Clips to look like the cat's whiskers. The title was cut out on my Wishblade. Who is ready for another sketch? 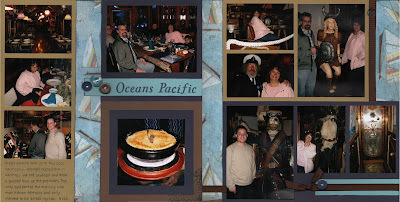 This month's single page sketch features one 4" x 6" photo, four smaller photos, and even some white space. I know, I'm still not very good with the white space but I'm working on it! 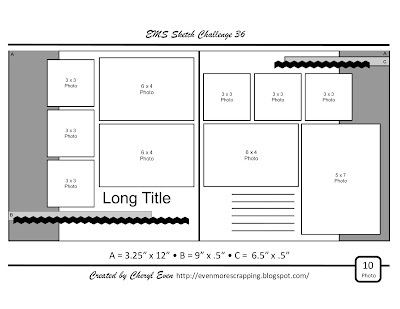 To help you out as you plan your page, here are some paper dimensions: the large piece of B&T is 7" x 10", and it is placed 1/2" from the top and left sides of your base paper. All the smaller strips are 1.5' wide, and the circles are 4.25" and 3". 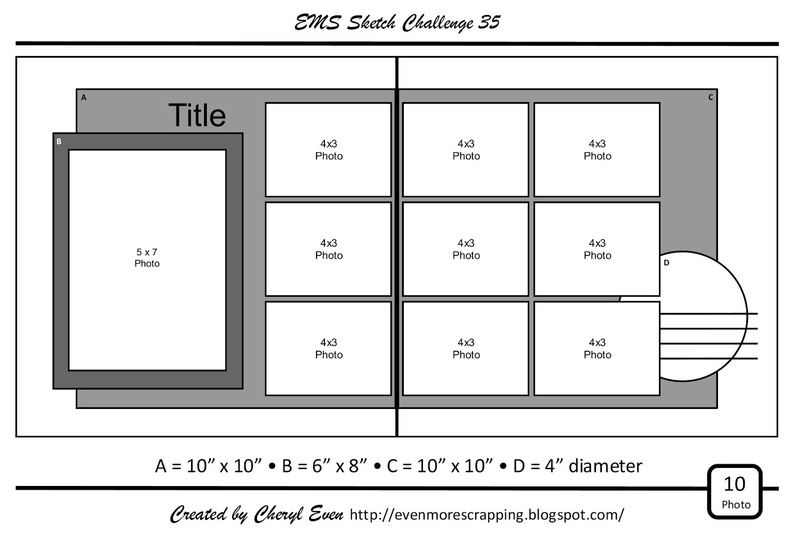 As always, adapt the sketch to meet your needs, have fun, and please share your finished layout with us by posting a link on the Heart 2 Heart Challenge Blog! Today's layout is another one I pre-designed in Studio J and copied using items from my stash. One of my blog readers asked me to elaborate on how I do the Studio J layout first and then recreate the layout, so here goes. If you're not interested, feel free to skip right down to today's layout! First, let me mention that I use Close to My Heart products almost exclusively. If you are using other products, Studio J is not so helpful as a design tool. I log onto Studio J, pick a pattern based on the number of photos I want to scrap, and then scroll through all the paper packs until I find one that I think coordinates well and that I know I have at least a portion of the pack on hand. The people at CTMH have already put together six paper combos based on the pattern I've chosen, and I select the one that best showcases my photos. At that point, I also verify that I have enough of the particular papers they use, so I can recreate the layout using traditional methods. I then drag my photos into the suggested photo wells, decide if I like the layout as is or if it needs to be rotated or any papers switched out. There are also suggested embellishments and title and journaling areas I can test-run. 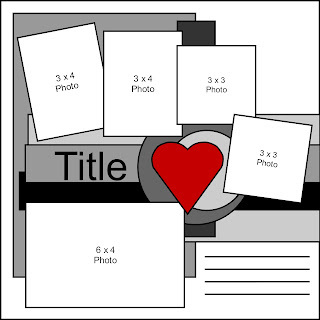 Basically, I end up with a completed layout that only took me a short time to design, I haven't spent any money, and I can order my photos and start scrapping, knowing that my end product will be something I really like. 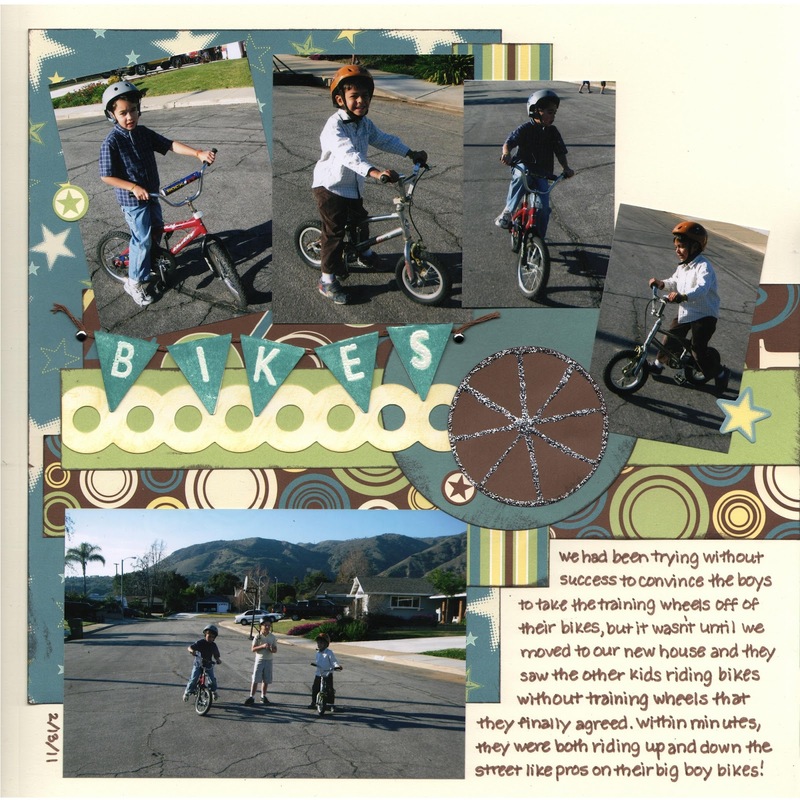 You could do this in other programs (like Photoshop Elements), but it would be a lot more work because you would have to scan all your papers and embellishments in order to test them out. My husband doesn't get this; he thinks it adds a lot more time to the process, but I love seeing the full picture before I even cut into my papers, plus the CTMH designers are so clever that I get great ideas from seeing what they came up with. It's like the ultimate in scrap-lifting! I decided I could justify buying new paper since I'm using up a lot of old paper this month, so I got the Florentine paper pack. 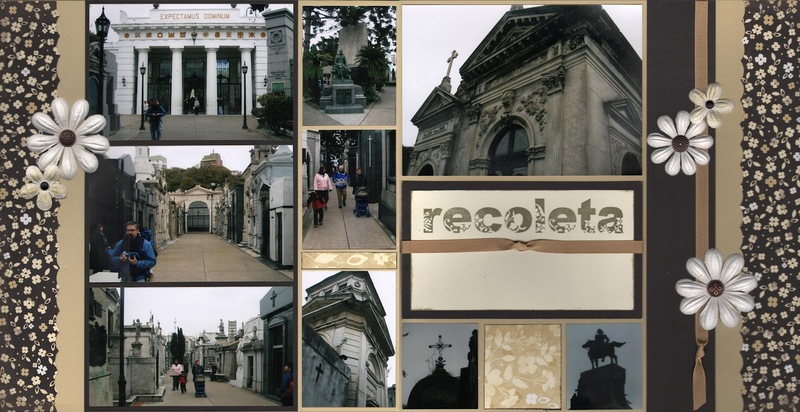 It's so pretty, and was perfect for these photos of the Gran Cafe Tortoni in Buenos Aires. I also used the coordinating My Stickease, and cut out a photograph of the sign outside the cafe to use as a design element. I plan to add a Flip-Flap once I have the layout in a Memory protector, so I can include two extra photos. We found a Hard Rock Cafe in Buenos Aires and thought it would be fun to say we'd gone! 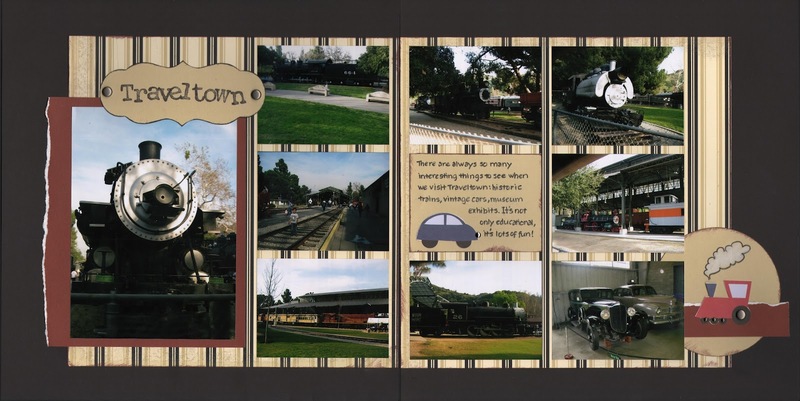 I pre-designed this layout in Studio J, and here's my paper recreation of it. The Studio J stickers were really fun, and I had to get creative designing the circle elements since I didn't have the exact stamps to copy the Studio J ones. I took a break from scrapbooking today in order to make 40 invitations for my son's upcoming birthday party. We're going with an Angry Birds theme, so I made circle cards that look like the red Angry Bird. It was a lot of work, so I decided to count it as my LOAD for today. It's actually a COAD, but hopefully you won't count that against me. I was inspired by this card by Tracey Sanders, but I added the white tummy and made my dimensions a little different. 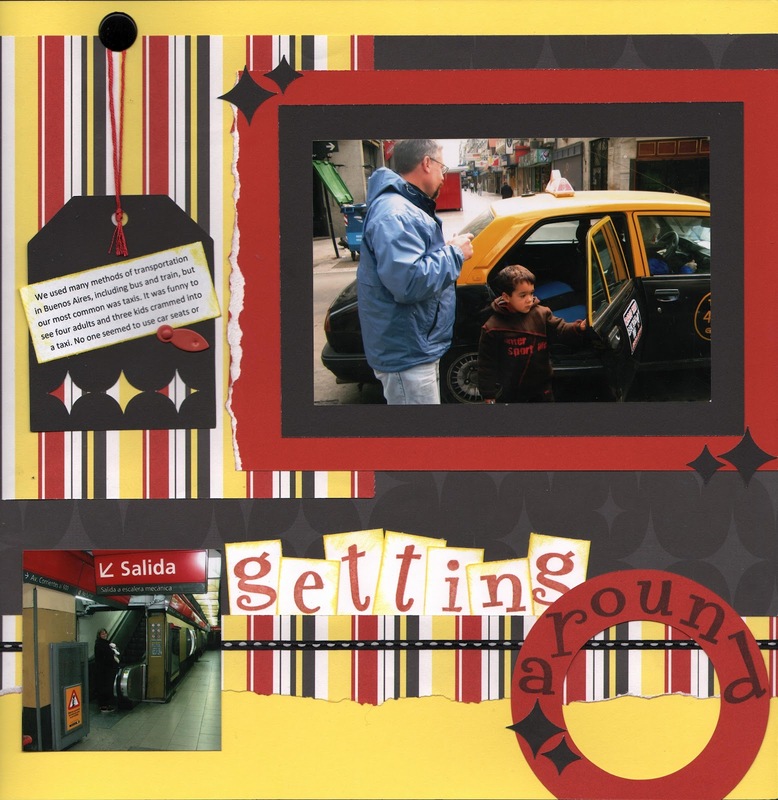 • Cut the card base in red using "Circle1" and the card function, 4" (p.21 in booklet). • Cut the crest using in black using "Accent" and the shift lock function, 2" (p.32 in booklet). Cut the extra pieces off the bottom of the flourish. • Cut the eye bases and the eyebrows in black using "Circle1", 1.25" (p.21 in booklet). Cut three. Cut one circle in half to use for eyebrows. • Cut the whites of the eyes in white using "Circle1", 1" (p.21 in booklet). Cut two. • Cut the beak in yellow using "Petal1" and the shift lock function, 1.5" (p.65 in booklet). • Cut the tummy in white using "Oval1", 1.25' (p.22 in booklet). You will have to trim off part of the oval once you adhere it so that it follows the curve of the circle card. • Punch the eyeballs out using a half inch circle punch. That's it. 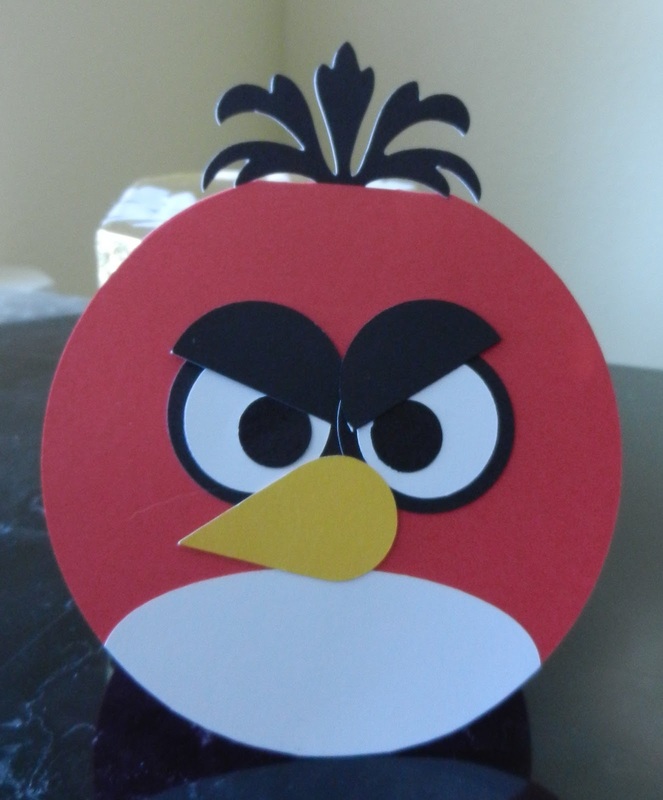 Just assemble your pieces, and you have a cute Angry Bird to give to your favorite kid. Have fun! 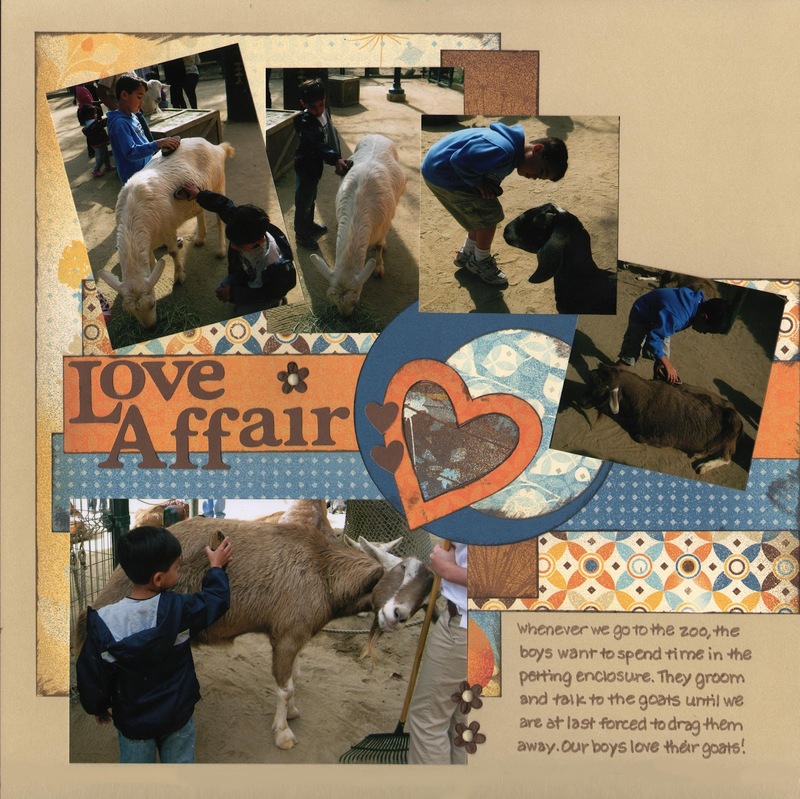 I pre-designed this layout in Studio J and was putting it together when my sleeve brushed against two of the photos and moved them from their original spot. I was going to put them back, but as I looked at them, I decided I actually liked them where they were. 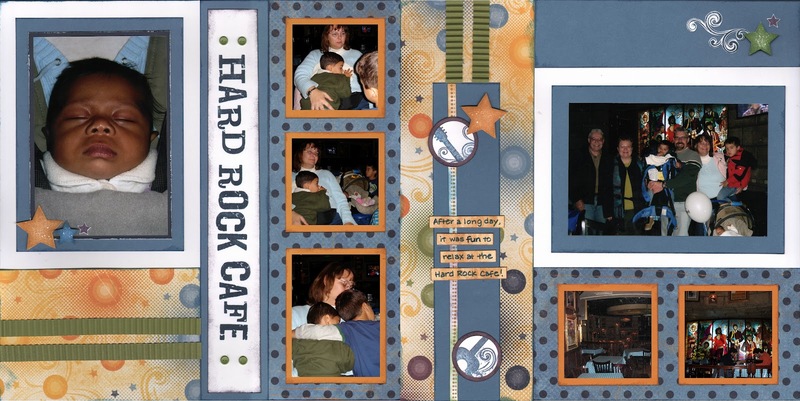 It inspired me to take the layout in a different direction from my Studio J creation. Don't you love happy accidents like that? I still need journaling on this layout. My in-laws are coming this weekend, and I think I'll put them right to work on that! 2) Use the sketch for Inspiration - I moved things around a bit but I think you can still see the bones of the sketch in my layout. 4) Use four decorative elements (bonus if they are 'sweet') - I used stickers, ric-rac, staples, and a banner. There was a fifth requirement: complete the layout in two hours or less. I guess I'm benefitting from all the layouts I've completed so far this month, because I started the layout at 4:20 and finished at 5:27! I never scrap that fast, so this was quite an accomplishment for me. 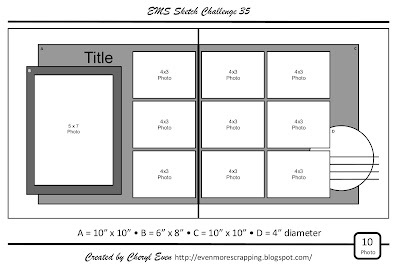 If anyone wants to play along with the challenge, it ends Wednesday night, so you have one more day to participate. We used many methods of transportation in Buenos Aires, including bus and train, but our most common was taxis. It was funny to see four adults and three kids crammed into a taxi. 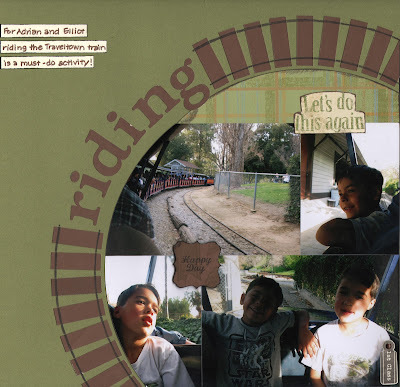 No one seemed to use car seats or even seat belts there, so each journey was a little bit scary. At least we were jammed in so tightly that we would probably have cushioned the shock for each other in the event of a crash! 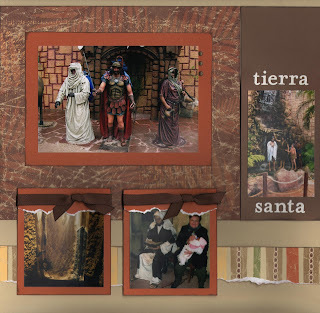 Today's layout features pictures from Tierra Santa, an amusement park in Buenos Aires dedicated to portraying the life of Christ. Although I didn't like it as much as the Holy Land Experience Park in Florida (possibly because the shows were in Spanish and I don't speak Spanish! ), it was nonetheless pretty interesting. I started this layout out with a sketch, adhered everything down, and then decided I hated it, so I ripped everything off and started over! I made up a design as I went along, and even though it will never be my favorite layout, trust me when I tell you it's better than before. I don't have any journaling on it yet, but the photos are from La Recoleta Cemetery, where Eva Peron is buried. For this layout, I used 2 Page Sketch # 24 from Sketch Support. I loved the curves on the top part of the sketch, and thought they represented the sense of motion I wanted to convey. No journaling yet; I'm waiting until my in-laws visit next week and can jog my memory about the events of this evening. Hopefully they remember more than I do! The title was cut out on my Wishblade. I decided to try to catch up with my scrapooking by doing a layout a day (LOAD) this month. We'll see how far I get! Here's my first layout. I pre-designed it using Studio J, and then recreated it with the supplies I had on hand. The title treatment is an old Becky Higgins idea that I haven't used for years, so I thought it would be fun to try it out again. Hope you like it.